The Patriotic Front (PF) leader Edgar Lungu December 7 replaced the Police Inspector-General Stella Libongani with one Kakoma Kanganja. Coming from the PF chieftain, the change is highly suspicious and his protestations of concern about political violence that accompanied it were at best self-serving and fake, at worst. 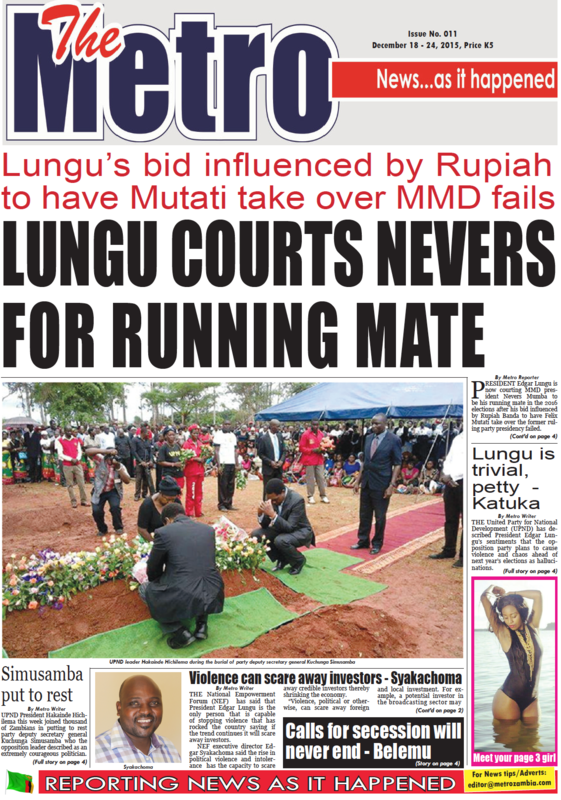 For, it was the same Edgar Lungu as Minister of Home Affairs who destroyed the police and brought it down to its knees where it remains. It was he who stoked the fires of political violence by allowing the PF carte-blanche. He is without doubt the worst-performing Minister of Home Affairs on record. His performance was thoroughly bad and in fact precluded him from ascending to the highest office in the land. However, this was too difficult to comprehend for the shallow-minded cabal of yesterday’s men who urged him on purely on the basis that he was the choice of late Michael Sata! He took up the position in what appears to have been some stupor or daze from which he never seemed to recover. On assuming office, he promptly announced the deportation of a man who had left the country of his free-will several months before! No explanation for the snafu has been forthcoming. However, informed commentators put it down to booze! Lungu, they insisted had as usual overdone the libation! It was under his leadership and through his consistent efforts that the police lost its operational independence and neutrality as a national law enforcement agency and this is the PF leader’s real legacy- the destruction of the police! He progressively and unashamedly turned a national institution into a PF militia targeted at the opposition. With him as Minister, the opposition parties operated under the ever present threat of arrest and PF violence. They were virtually proscribed. Their meeting notices were invariably turned down -in flagrant violation of the Constitution. Opposition leaders were regularly brutalized, impeded or arrested on trumped up charges. In the celebrated Kitwe case of the MMD President Nevers Mumba, the state failed to offer any evidence and it had to be discontinued! His conduct at Home Affairs raised real questions of his character, motivation and judgement and on no account did he score highly.